When Joe Czajkowski delivered a ton of carrots, already peeled and “coin-cut,” to the Western Massachusetts Food Processing Center last week from his 99-year-old Hatfield farm, Liz Buxton and her crew got to work. Next February will be promoted as “carrot month” as part of the Massachusetts Farm to School Partnership. 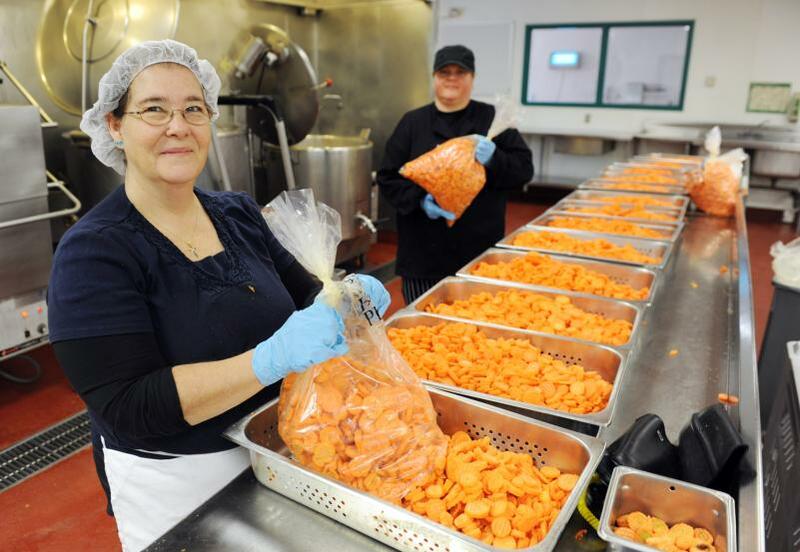 So the Greenfield commercial kitchen had a line of half a dozen workers blanching, bagging, and then freezing the sliced orange vegetables for delivery to schools around the region in late January so cafeteria workers can prepare them as part of locally enhanced meals. CDC this summer processed nearly 10,000 pounds of tomatoes from Red Fire and Atlas farms that it is now getting ready to turn into marinara sauce with some of the 1,300 peppers it received from Red Fire Farm, as well as local onions. It is hiring a food development specialist to help market the local produce to food service directors and their product distributors, and also trying to work with growers to sell their fruits and vegetables to the CDC to become part of the growing local food chain. The CDC is also using a $250,000 U.S. Department of Agriculture loan and $50,000 grant to buy a new freezer as well as flash-freezing and related equipment to ramp up its production of local produce for school sales as well as to help farmers’ own supplies for their winter customers. The CDC, has had to downsize from the roughly 16,000-square-foot freezer it originally sought to one that’s maybe 12,000 square feet, and that’s slowed the process, said Waite, but it’s also given the food processing center a chance to learn the importance of working with distributors such as Sysco or Thurston Foods, since food-service directors have balked at the idea of picking up produce. It’s also about hiring someone who can handle marketing, a job that’s proven too much for Waite or Buxton to handle, so they can also promote the commercial kitchen to some of the small-scale food manufacturers who pay rent to use the facility. “We’ve learned it’s about efficiency, and efficiency comes with volume,” said Waite, who spent a few months trying to fill a staffing gap this summer while also trying to connect farmers and food service directors with products and occasionally filling in on the production line as well. “We’re committed to this, and the only way to increase sales is to increase marketing and build relationships,” he said. The shared kitchen last year handled 65,000 pounds of vegetables, largely freezing and canning them for schools and colleges, including Deerfield Academy, Williams College and Hampshire College in Amherst. That is down to 20,000 or 30,000 pounds this year, mostly for Community Supported Agriculture operations to offer their members and farm stands to sell to customers, in the form of spaghetti sauce and applesauce — think 1,800 pounds of apples from Atkins Farm in Amherst— as well as frozen peaches, blueberries and strawberries. With the fast-freeze and other equipment planned for deployment at the Wells Street facility by next summer, and with the kitchen getting ready for new USDA meat inspection certification beginning next month, with a meat-pie maker already lined up to use in the kitchen, Waite said he is already looking ahead to the day when the CDC can sell local frozen vegetables through Foster’s and Green Fields Market. He’s also looking at seeking a grant to prepare soups for Just Roots community farm. Meanwhile, Waite has been meeting with food service directors from Amherst and Hampshire colleges, as well as with Hampshire’s farm program, about continuing to use the Greenfield kitchen to process its tomatoes and other produce. The kitchen even pureed 4,000 pounds of leftover fruit from the University of Massachusetts’ Guinness-Record, 15,000-pound fruit salad in September, for freezing and later use in making smoothies. And proving the value of connections, the CDC worked through Hampshire’s Bon Appetit food service to make tomato sauce from a Connecticut farmer for Wesleyan and St. Joseph’s colleges. Another lesson along the way is about the definition of “local,” at least when it comes to processing produce to extend the marketing season for sales to institutions that keep feeding people long after the growing season has ended. “Now a lot of local is regional,” said Waite, pointing to research efforts by Farm to Institution New England, the six-state collaboration that started with a USDA grant in 2011 to beef up agricultural sales to schools, colleges and other institutions around the region. Working with two northern Vermont commercial kitchens, two more on the Maine coast, as well as others in Boston and Rhode Island, the CDC here is trying to avoid duplicating costs for expensive, specialized equipment that may be based elsewhere. He points to the Northern Girl processing center in Maine, which is already equipped to deal with tons of potatoes and broccoli florettes. “Maybe there’s a little specialization around New England, where we’re cooperating instead of competing,” said Waite. “Now there are distributors bringing in vegetables from California, so they can bring from Maine to Massachusetts, from Massachusetts to Maine and go back and forth, that’s a lot better than bringing it across the country.